Carl Norden's development and production of his well-known bombsight provided the solid base from which the company grew for the next 85 years. The company was formed in 1928 as Carl L. Norden, Incorporated. A separate company, Norden Laboratories Corporation that he started in 1943 has a direct lineage to the Norwalk facility that closed in 2013 and did not officially include the name Norden when it closed. It was simply a business unit of Northrop Grumman's Electronic Systems. This retrospective recollects the camaraderie and work that we remember. If you have more to add send it to the Webmaster and we'll publish it. 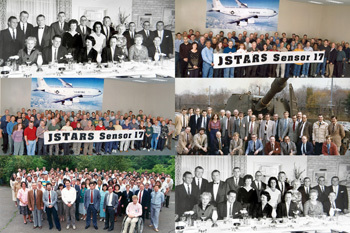 The name changed from Norden Laboratories to Norden Instruments Division of Norden-Ketay to Norden Division of United Aircraft Corp. to Norden Division of United Technologies Corp. to Norden Systems, Inc. Subsidiary of United Technologies to Westinghouse Norden Systems to Northrop Grumman Norden Systems, Inc., to Satellite of Northrop Grumman's Electronic Systems. But, it was called "Norden" by most and "Nordens" by many. 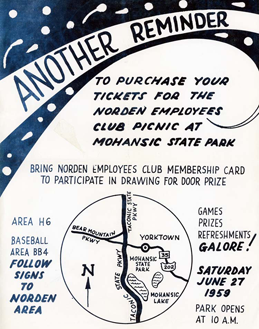 Norden moved its facilities numerous times over the years - from Varrick St., in NY City to Westmoreland Av., White Plains to Wiley St., Milford to Helen, St. (renamed Norden Place), Norwalk. Norden had close to 5,000 employees with locations in Connecticut, Massachusetts, New York, Pennsylvania, Louisiana, New Hampshire, Alabamha, California and New Jersey at the same time. Five facilities in Connecticut alone. Almost Anything Goes - A yearly outdoor event with 10 groups or so competing with crazy games of "skill" and attended by hundreds of friends and families. The extravagant yearly picnics paid for by the company. The Dynell acquisition in 1977. Cafeteria expansion to accommodate the expanded employee population. The big turtle in the courtyard. The Norden bowling league. We had at least ten teams competing against each other. Norden's fire department including a fire truck. The helicopter landing pad in the front of the building. The executives flipping burgers at the yearly Sherwood Island Picnic. The Bear Mountain Radar Test Range. IHAS, AFFSS, C-5, Conalog, A-6, and B-52 development and/or production at the same time. Norden recovered and refurbished the Space Shuttle booster rockets and supplied the first graphical all-electronic cockpit displays for the manned vehicle. The transformation of the Executive Dining room into the Technical Library. While everyone remembers the Norden bombsight few of the current retirees had anything to do with it although repairs continued in Norwalk through the 1960's. Many of us were involved in programs that we committed blood, sweat and tears to. Some of them are listed below. See our photo gallery of many of the platforms containing Norden equipment. One way of recalling these programs is through the ubiquitous coffee mugs that were etched with program logos like you see to the left. 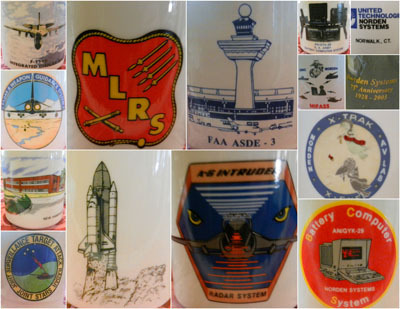 You can see our full coffee mug collection here. Then there were the fun activities such as company picnics and the incredible "Anything Goes." 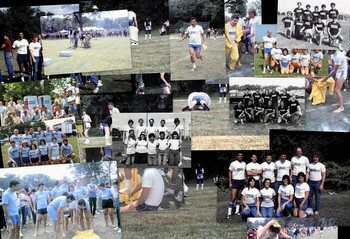 At one time or another you probably gathered together for a group photo of your program team or for some other reason. We put a few of these together (see left) and you might find yourself and certainly plenty of people you know in the enlarged photos. And people in their offices, labs and on the production floor in 1998 here. You can view photos of people at the club events here. Members can access the Member's Only section of the website and see Club Newsletters dating back to 1994. Many contain photos that are not otherwise published on this website. Some of the newsletters published by the Company for the employees can also be found there. There is a collection of Norden items offered on eBay that should be of interest. 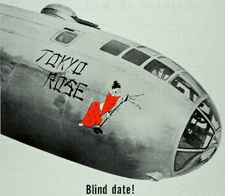 Random photos dating back to the 1940's can be found here. Look at this 1979 phone directory. Who do you remember? Gray Wolf and Snake Eyes pod programs. Read the Spirit of '76 Pod Newsletters. Secret Guided Missile Work at Norden revealed in 1956. Read.